You would see Starfish if you go tide pooling. it is popular among the younger crowd. Starfish is a well-known creature. They have no front or back: they can move in any direction without turning. Rather than using muscles to move their hundreds of tiny legs, starfish use a complex hydraulic system to move around or cling to rocks. The intake valve for this system is generally located on the top of the Starfish, just off center, as can be seen clearly on the Leather Star (Dermasterias imbricata). If you've ever tried to pry a Starfish off a rock, you know how effective its hydraulic system really is. The starfish don't have to make themselves symmetrical. They can rearrange their arms any way they please in order to wedge themselves into a small nook in the rocks, as you can see in the almost human-looking Knobby Star (Pisaster giganteus). Starfish are usually sluggish, have five or six arms and get pretty stiff when you try to pick them up. The Sunflower Star (Pycnopodia helianthoides) breaks all of these stereotypes. It typically has around 20 arms, moves, practically flows, quite gracefully across the surface, and is soft to the touch. When a starfish lost an arm, it will grow back. Other interesting starfish include: Ochre Star (Pisaster ochraceous), Bat Star (Patiria miniata), and Six-rayed Star (Leptasterias hexactis), mottled Starfish is also a Bat Star. Starfish may not be considered a fish, but are animals belonging to the Phylum Echinodermata, and are further divided into two classes Asteroidea (sea stars) and Ophiuroidea (brittle stars). Although starfish are thought to be passive they can be quite a voracious predator under the sea. Starfish feed primarily on mollusks and other echinoderms. While starfish are commonly represented as having only 5 legs, there are some that exhibit many more as seen below. 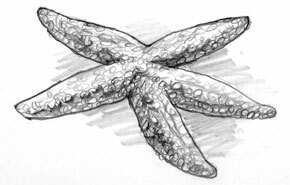 Sea Stars characteristically have five arms extending from a central disk like a star. In the aquarium they can be fed small pieces of fish, placing the food near or even under the Sea Star. Serpent and Brittle Sea Stars are popular additions to reef aquariums that contain live sand as they constantly stir the sand bed and provide oxygen to the beneficial bacteria living in the sand.